From a crowd of tech bloggers, even I was taken aback with its reception. Size alone isn’t what makes this handset remarkable. In part what makes the device exciting is that it’s the rebirth of Palm, the same company that made big ‘ole PDAs and the ill-fated Palm Pre. Maybe more interestingly, Palm’s new phone also envisions an entirely different way of using and living with tech. For something so small, it’s pretty mysterious, and I’m actually not even entirely sure what to call it. The company that makes it is Palm, but what about the device itself? Is it just Phone with a capital P, or is it the Palm Palm as its comical listing on Verizon’s website suggests? For now, I’ve been going with Baby Phone or the just the mononymous Palm, because like Grimes, Wario, and Rasputin, this gadget is cool enough to need only a single name. Don’t you just want to squeeze its cheeks? Now let’s talk about size. I don’t mean its actual dimensions—which are about the same as a credit card—but the reason behind why it’s so tiny. Recently, a lot of companies have been pushing the idea of digital wellness, with Google and Apple adding features to Android and iOS that help you track how much time you spend on your phone. That’s all fine, but in some ways, buying an $800 phone and then putting restrictions on it is like buying an Aston Martin and never driving it faster than 55 mph. So instead of spending a lot of money on a phone that constantly tempts you, why not get something small and nimble that can still handle traditional smartphone duties, but doesn’t also ruin your life. That’s the real inspiration behind the Palm’s pint-sized body and mini display. You’re supposed to pull it out, check the screen real quick, and then put it away. As small as the Palm looks, it feels even tinier in real life. The Palm is a more straightforward way to fight smartphone addiction, and while it does quite well at replacing your regular phone, it has some quirks and a few sore spots you should know about. I’m going to break things down The Good, the Bad, and the Ugly style. First comes the good stuff. 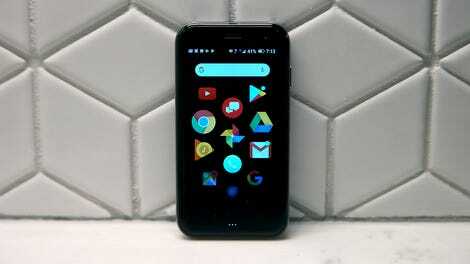 Unlike a dumb feature phone or other gadgets that attempt to fight Internet-driven FOMO, the Palm runs a full mobile OS (Android 8) with a custom home screen/app launcher designed to be easy to use on a tiny display. That means it supports all your favorite apps, and launching them is as simple as scrolling through a relatively compact grid of app icons and tapping on the one you want. The USB-C port is nice, but the Palm is one of the first phones that might actually make sense with no ports at all. Sure, things like text and quick settings icons look small, and if you’re someone who thinks about bifocals a lot, this may not be the device for you. But for everyone else, screen readability and UI navigation aren’t actually that bad. There’s even an old-school capacitive touch button below the screen that can be tapped once to go back, tapped twice to go home, or long-pressed to open up all your recent apps. On top of that, the Palm was designed to be used hands-free, by leveraging voice controls and the Google Assistant to do things like reply to texts or search for directions. If you feel weird about talking out loud to your devices, using the baby phone like this does take some getting used to, but it works. The phone even has a simple 2D face unlock system, so you don’t need to hit tiny number buttons every time you want to unlock your phone. And instead of squeezing the sides of the phone or long-pressing its home button, you can summon the Google Assistant just by holding down the power button, which is the phone’s lone physical control. Then there’s the baby phone’s build, which feels surprisingly solid. I really can’t help but admire how nice it is for a phone this small, especially since it can be stowed away almost anywhere. It utterly disappears into pockets, and you shouldn’t run into any issues sliding it into even the smallest of clutches. You can even stash it in your jeans’ coin pocket, or jam it down your sock if you’re so inclined. So, of course, it also feels puny in your hands like no other smartphone does. The baby phone’s screen is also exceedingly bright, hitting 808 nits on our light meter, which is higher than any phone I’ve tested in the last 18 months. And despite weighing barely more than two ounces, it still offers an IP68 rating, so it’ll survive a quick dip in water. Even with a protective leather case, you can fit the Palm’s baby phone almost anywhere. Now onto the bad. Like most new smartphones, the baby phone doesn’t have a headphone jack or microSD card storage. However, due to its diminutive size, the excuse about not having enough room inside actually holds up. Same goes for the Palm’s lack of wireless charging, though, it would be kind of neat if the baby phone were a truly wire-free device. As for its camera, the Palm sports a 12-MP cam in the back and an 8-MP selfie cam up front. In bright light, these cameras are serviceable, though as you’d expect, the Palm’s pics don’t quite deliver the quality of what you’d get from a Pixel 3. Then again, with a retail price of $350, I’m not that bothered. But when things get dark, the Palm’s cameras struggle quite a bit more. The Pixel 3's photo is clearly better, but for a $350 phone, the Palm’s shot is passable. Again, colors in the Pixel 3's shot are richer and the shot is better exposed, in comparison, the Palm’s bright light shots are usually good enough. In low light though, the Palm really struggles. Look at all the grain and noisy, blurry details in the Palm’s shot. Finally, while I wouldn’t exactly call the Palm’s performance or battery life bad, it fits best in this section. Browsing around between apps is usually quite snappy, but equipped with just a Qualcomm Snapdragon 435 chipset, it’s sort of ridiculous to ask for more. That said, you can still play things like Super Mario Run or Pokémon GO just fine, but in absolute numbers, the baby phone’s benchmarks are some of the lowest I’ve seen in a while. As for battery life, on our rundown test, it lasted a laughable three hours and six minutes, which is a quarter of what you get on a lot of flagship devices. But our test is performed by streaming video continuously over wifi, which goes against the entire idea of the phone, so it shouldn’t be a surprise that those numbers look bad. And if you play even the most casual of games like a match-three puzzler, you can crush the baby phone’s battery in 90 minutes or less. Remember OG Palm’s graffiti gestures? They are back, kind of. But if you actually try to embrace Palm’s internet-addiction fighting ways by just checking your phone a couple of times an hour, streaming music a little bit, and limiting it to other practical purposes, it’s quite possible for its battery to last all day. Instead of being a true con, the Palm’s battery life is almost a pro, because it punishes you for sliding back into abusive habits. 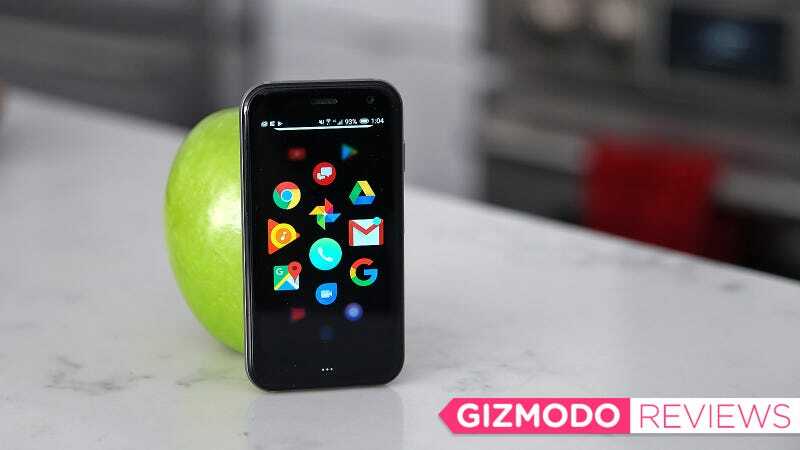 Palm’s baby phone can help you improve your digital wellbeing, but only if you let it. For those still concerned about longevity, Plam even equipped its device with something called Life Mode, which helps preserve battery life while also cutting down on distractions. In this mode, when you lock your screen, the phone goes into a super Do Not Disturb of sorts. And as long as your screen stays dark, you won’t get any calls, texts or notifications. Then, when you want to check in on the world, you can unlock your phone and get a quick recap to fill you in. No matter how I tried, I couldn’t get that SIM tray open. All told, the negatives above aren’t that bad, but just when you thought it was safe, comes Palm’s ugly side. The first nasty omission is that the Palm only sports 802.11 a/b/g/n wifi, which means that the phone can’t see any 5GHz 802.11 ac networks. But the Palm’s second and biggest deal-breaker for many is that the Palm is a Verizon exclusive, which leaves 65 percent of potential U.S. buyers out in the cold. And while the phone is technically an unlocked device, the pinhole for the Palm’s SIM tray is so small it’s damn near impossible to remove, and there’s a good chance you might damage the tray if you try to force it. And as if to discourage any additional attempts to remove the SIM tray, the Palm doesn’t come bundled with its own ejector like most phones nowadays. And even if you do manage to crack open that SIM tray, the baby phone is missing a number of LTE bands that would allow it to work fully on other networks. Despite capacitive touch buttons being somewhat out of style, it works on the Palm. That said, gesture navigation would be even better. To make matters worse, because this phone is billed as a companion device, Verizon won’t sell you a baby phone unless you already have a primary device (even though the Palm works just fine on its own and doesn’t actually need a second device to connect to cell service or wi-fi). And if that wasn’t enough, on top of the Palm’s $350 price tag, you’ll also need to fork over $10 a month for data and the luxury of using Verizon’s Number Share service, which allows you to use the same phone number across multiple devices instead of having to juggle a second set of digits. Number Share also lets the Palm sync texts with your primary phone, so you don’t miss any messages, but only if you use Verizon’s texting app. Now don’t get me wrong, I can totally see the appeal this thing being used to compliment a larger and more powerful handset. You have one phone for work and business, and the Palm for everything else. Going out for a fancy dinner and don’t want to be loaded down with tech? The baby phone is an easy choice. Or how about going for a run? The Palm is a better option for making sure you are reachable and for streaming music than many wearables, even the ones with built-in LTE. Here’s the size of the Palm compared to a Pixel 3. But not allowing the Palm to operate as a standalone phone is a tragedy. It would be a great handset for kids, and its battery life might mean teens would actually stay off their phone for fear of running out of juice. And what about all the people that just want a phone that’s small, cute, and simple. Forcing people to buy two phones when all they really want is one seems incredibly dumb. The Palm is one of the best examples yet of how you can stay connected without letting it drive you crazy. It can go practically anywhere, and it has just enough to make sure you don’t feel deprived. At first, I thought this tiny little phone was a snack. But you know what, that’s not quite right. It’s more like a full meal in a bite-sized package. And even with all the big shiny phones that came out this year, this little baby phone with child-like specs is easily one of my favorites. It’s a shame that some of the business decisions behind it mean that more people won’t be able to see it for the treat is truly is. This thing is gloriously tiny and feels even smaller in real life than it appears in photos. It’s a Verizon exclusive, and only available as a companion device for people who already have a primary phone. Full price is $350 plus an extra $10 a month for data and use of Verizon’s Number Share service. You can crush the Palm’s battery by playing games or doing other more intense tasks, but if used as intended—i.e., as a way to stay connected but without constantly staring at a screen—it can last all day. The Palm runs a full version of Android 8, which means it supports all your normal apps, though you might have to squint a bit to see them. [Update 10:55 AM] Added more information regarding the Palm’s SIM tray and the phone’s carrier exclusivity.